Paul Stevens reviews some of the numerous technologies that are helping automotive manufactures to deliver vehicles that consume less fuel and produce fewer harmful emissions, but without sacrificing performance or comfort. One of the few positive outcomes from the recent downturn in the world economy has been the falling price of oil. When oil was around $150 per barrel the public's perception of the importance of fuel economy changed significantly. While it is true that the price of oil has dropped, the price is sure to rise again when the global economy starts its recovery. Furthermore, regardless of the price of oil, automotive manufacturers are still faced with the need to meet ever-tougher emissions regulations. A broad array of strategies is being pursued with the aim of improving vehicle efficiency. While there are plenty of radical projects underway relating to alternative fuels, this present article is focusing on some of the many innovations that are taking place. Each of these could make a small difference to vehicle economy - and, therefore, emissions - but when combined together the result could be very significant. 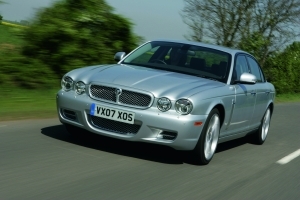 As part of the Ford group, Jaguar was one of the first volume manufactures to adopt aluminium for the main vehicle structure of its XJ models (Fig.1). Being lighter than steel, aluminium presents the opportunity to save weight and therefore reduce fuel consumption. 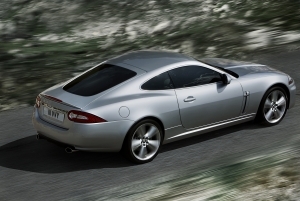 Aluminium is also used for the body structure on the latest Jaguar XK models, which were shown for the fist time at the Detroit Auto Show 2009, with the weight reduction helping to improve performance (Fig.2). 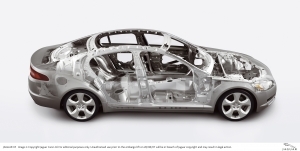 Interestingly, the Jaguar XF shuns aluminium in favour of the latest generation steels, including high-carbon steels, dual-phase, hot-formed boron steels, and bake-hardened steels to form a vertical safety 'ring' around the occupant cell (Fig.3). A further advantage is that these steels enable the XF's A- and B-pillars to be slimmer, which benefits visibility and accessibility. The lower sills on the XF are the first component on any Jaguar to use high-strength dual-phase DP600 steel. High-strength and ultra-high-strength steels are becoming more popular among higher-volume manufacturers too. For example, GM's second-generation Opel and Vauxhall Zafira is based on the new Astra's architecture, albeit modified and reinforced for the larger and heavier Zafira. As well as completely redesigning the front end and body, the engineers have optimised rigidity, strength, crash behaviour and pedestrian protection. To achieve this, up to 51 per cent of the body is manufactured from high-strength or ultra-high-strength steel. Much of the lower section is formed from tailored blanks in which the high-strength steel panels have a thickness that varies between 0.75 and 1.5 mm. This ensures strength is sufficient in areas subject to stress, while avoiding unnecessary weight. Compared with the previous generation of Zafira, the new model benefits from a 30 per cent increase in torsional stiffness. Flexural strength, which is important for occupant comfort, is 74 per cent higher. This remarkable increase was achieved by optimising the tailgate opening, reinforcing the door sills, and careful design of weld points and specification of sheet-metal thicknesses. In terms of passenger protection, the new Zafira is said to be particularly safe in side-impact collisions, since the force of the impact is channelled over a wide surface area into the body structure by reinforced A- and B-pillars, sills and doors with a reinforced, bending-resistant door well, and wide, ultra-high-strength steel impact protection guards. The energy absorption zone for rear-end collisions is restricted as far as possible to the area behind the third row of seats, with the high-strength occupant cell located in front of this deformation zone (Fig.4). 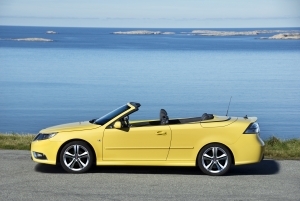 When the Saab 9-3 Convertible was launched in 2007, it was claimed to have a level of structural integrity that placed it at the top of its class. High-strength and ultra-high-strength steels have been used extensively, accounting for about 60 per cent of the Convertible's body weight (Fig.5). Another notable weight-saving feature on this car is the use of magnesium for the soft-top frame, swivelling braces and front header rail. Existing dual-phase cold rolled steels offer carmakers weight reduction benefits through down-gauging (reducing the material thicknesses) for certain applications. However, cold rolled products can only be used for vehicle applications with a gauge range of 0.6 to 2mm. At the end of 2008 Corus announced that production-ready coils of Dual-Phase 600 hot-rolled steel (DP600HR) in gauges above 2mm were available. This will help carmakers to reduce weight in areas other than the vehicle body structure. According to Corus, DP600HR offers potential weight savings of 10-20 per cent in component assemblies requiring exceptional durability and strength performance, such as sub-frames, lower and upper control arms and wheel centres. Moving on from structural components and assemblies, there are plenty of opportunities to reduce fuel consumption by improving the engine. So many different routes are being pursued that they cannot all be covered here. However, there are two projects that can be used to illustrate the type of work going on. 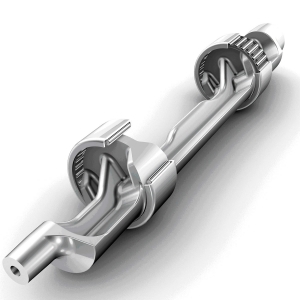 The first of these is the lightweight balancer shaft and rolling bearing assembly that the Schaeffler Group has started manufacturing for the new Mercedes-Benz OM651, a 2.2 litre, four-cylinder diesel engine that produces a maximum power and torque of 204 PS and 500Nm, respectively (Fig.6). It is claimed that the OM651 sets new standards in terms of performance and fuel consumption, with the lightweight INA balancer shaft and bearing assembly playing a significant role in improving engine efficiency and overall fuel consumption. By replacing the balancer shaft's conventional plain bearings with needle roller bearings running directly on the shaft, friction is reduced by up to 50 per cent over the entire speed range. Furthermore, Schaeffler's development engineers were able to analyse the engine load conditions and optimise the balancer shaft's weight distribution, which enabled the width of the bearing to be reduced and the weight of the shaft cut by more than one-third. This equates to a weight saving of 0.75 kg. When designing the complete drive train for the OM 651, the Mercedes engineers were able to take advantage of the lower shaft mass moment of inertia of the balancer shaft to improve the acoustic characteristics. In addition, the narrower raceway improves the oil mist supply to the bearings, so a simpler system design without oil feed holes was possible, resulting in lower manufacturing costs. And because the engine requires a lower throughput of oil, the oil pump can be smaller. Taken together, these technical improvements meant that engine fuel savings of around 0.5 to 1 per cent were achieved. 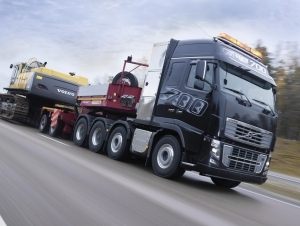 On an altogether larger scale, the 16-litre D16G engine in Volvo's new FH16 truck boasts 700 horsepower and 3150 Nm of torque (Fig. 7). This engine is a further development of Volvo's previous D16 engine that produces 660 HP. In addition to an extra 40 HP and higher torque, the new engine benefits from cleaner emissions, meeting the Euro 5 requirements that come into force in October 2009. Despite the higher power, fuel consumption remains the same as the current D16 engines. Through a number of measures - including redesigned pistons - Volvo's engineers have optimised the combustion process and met demands for high performance, efficient fuel consumption, low emissions and long lifetime. Both maximum power and maximum torque span a wider range of engine speeds than before, contributing to improved driveability. The engine now also features a new oil thermostat that has a favourable effect on fuel consumption. Another important change is that the engine is combined with a new and larger exhaust after-treatment system. Since the system can handle a larger flow of exhaust gases, back-pressure is reduced and power losses are minimised. After the engine, the transmission is the next most important element of the powertrain in terms of fuel efficiency. At the end of 2008 Hyundai commenced production of an all-new compact six-speed automatic transaxle that it claims will deliver a 12.2 per cent improvement in fuel economy - if not better - for transverse-engined SUVs (sport utility vehicles) and passenger cars. Hong-Min Kim, the project manager at Hyundai's research and development centre, states: "The strength of our design is its completely unique layout, which makes it smaller, more compact and lighter than any other six-speed on the market today." 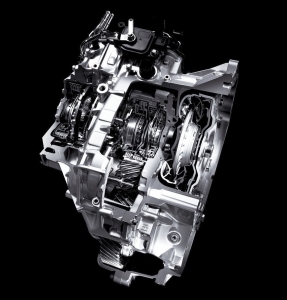 In fact there are so many innovative features within the transmission that Hyundai has applied for nearly 300 patents. Hyundai's Grandeur will be the first vehicle to benefit from the new transaxle. In this application it will be coupled to a 3.3-litre V6 petrol engine and deliver a 12.2 per cent gain in fuel economy. In addition the transaxle gives a 2.5 per cent (0.2 s) reduction in the time to accelerate from zero to 100 km/h (62 mph) and an 11 per cent (0.5 s) improvement in the 60 to 100km/h overtaking time. Despite the extra gear, the new transmission it is 12kg lighter than the five-speed unit it replaces. It is also 41mm shorter and considerably simpler, having 62 fewer parts, which is a key to increased durability and lower cost. The addition of a sixth gear enables closer spacing between ratios, thereby providing a better balance of performance and fuel economy, while the wide overall gear ratio helps deliver strong acceleration. Inside, the gearbox has three planetary gear sets and an innovative flat torque converter that reduces the unit's overall length by 12 mm. Hyundai is not alone in developing a six-speed automatic transmission; UK-based transmission technology specialist Antonov Automotive Technologies has completed the first phase of its agreement with Loncin for the development, manufacture and marketing of a small six-speed automatic transmission for China's fast-growing car market (Fig. 8). Six-speed automatic transmissions are said to be much desired by Chinese consumers, but these currently have to be imported. Antonov says that all of the technical milestones for the first phase of the development have been achieved, including shift quality, drive comfort, NVH (noise, vibration and harshness) refinement, mechanical efficiency, fuel consumption, manufacturing feasibility and the production of prototype transmissions for testing and development. Antonov's chief executive John Moore commented: "The prototype transmissions have demonstrated the key benefits of the Antonov six-speed design in its efficiency and ease of calibration. Within a few weeks of the first build, we have been able to demonstrate competitive shift quality and excellent efficiency. The prototypes have shown a 10 per cent fuel economy improvement over the EU Urban cycle compared with the standard Aisin-equipped six-speed vehicles." Another interesting development from Antonov is a simple dual-speed drive to help alternators and other engine ancillaries operate more efficiently. Such drives can better match the speed of the ancillary to the vehicle requirements and improve battery recharging. Antonov says the characteristics of its innovative duel-speed drive (known as the Antonov mechanical module or AMM) can be tuned to meet specific vehicle requirements. 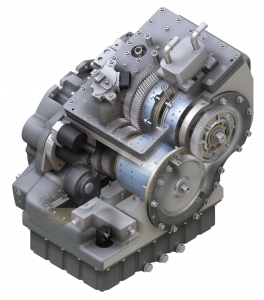 Essentially a self-controlling, automatic, two-speed gearset, the AMM can be mated to an alternator to provide improved battery charging at engine idle without incurring losses at higher engine speeds (Fig. 9). In this application, it can also provide a reduction drive to enable a compact front-mounted starter-alternator to be used for engine stop-start applications. 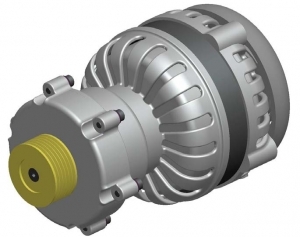 The company, which is developing the system for OEM applications, says a dual-speed alternator designed for stop-start operation can deliver an 18 per cent saving of electrical energy over a typical light commercial vehicle duty cycle. The AMM can also be applied as a dual-pulley unit to give a two-speed belt-driven alternator, air-conditioning pump and water pump, whereby the accumulated energy saving translates into a 5.6 per cent reduction in fuel consumption. This is achieved with a 2:1 gear ratio change at 2000 rpm. Ultimately the company aims to introduce a compact unit that is mounted directly to the engine crankshaft, but this will require much greater development integration with the base engine. Chris Baylis, the operations director at Antonov, comments: "Customers and legislators are placing more demands on vehicle electrical power, with lower emissions meaning smaller petrol and diesel engines, lower engine idle speeds and more stop-start systems. Even daytime headlight legislation is increasing the electrical load." Another application of the AMM device is to facilitate low-cost engine downsizing by using it as a two-speed drive on a centrifugal supercharger. The resultant higher drive ratio at low engine speeds means that the smaller engine 'feels' bigger to the driver, allowing for less gear down-changing and improved fuel economy.